A boyfriend is a male friend or acquaintance, often specifying a regular male companion with whom one is platonic, romantically or sexually involved. This is normally a short-term committed relationship, where other titles (e.g., husband, partner) are more commonly used for long-term committed relationships. A boyfriend can also be called an admirer, beau, suitor and sweetheart. The analogous female term is "girlfriend". 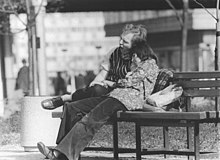 A woman with her boyfriend at Alexanderplatz in March 1975. ^ Hunt, Lana J. "Ladies and Gentleman". Archived from the original on 28 July 2012. Retrieved 6 May 2012. Look up boyfriend in Wiktionary, the free dictionary.